Click here for a downloadable PDF of the Travel Tablet Coloring Book Fundraising Sheet! 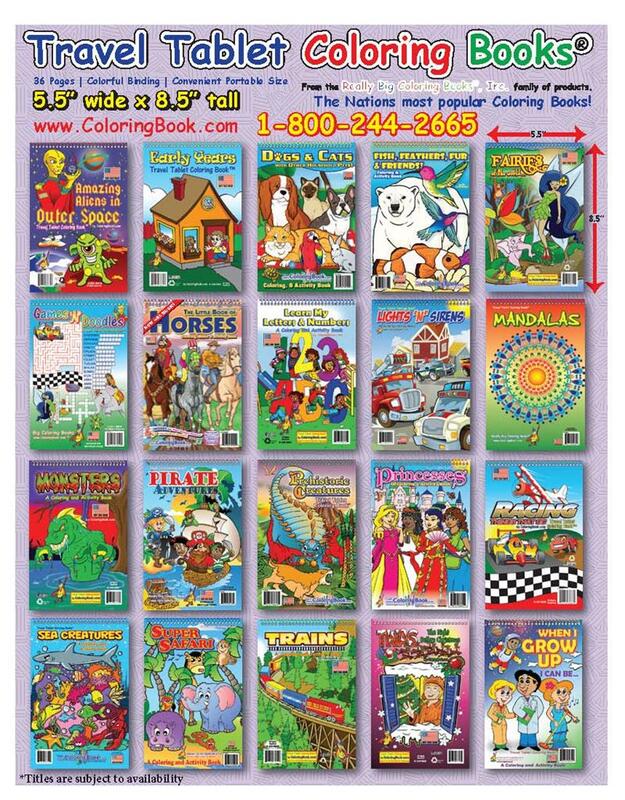 Travel Tablet Coloring Books ® have sold very well in fundraising and retail markets! Travel Tablet Coloring Books ® are all 5.5" wide by 8.5" high and will keep a child entertained for many hours and are small enough to carry around in a purse. We manufacture kids coloring books at the best competitive rates. We participate in Green Technology that is friendly to the environment with soy inks, recycled paper and the sustainable forestry initiative! Coloring Books designed to make your business money. Here you can purchase one (1) copy or a truckload. The usual cost on this line of books for fundraising is $1.29 each and you can re-sell for $1.99-$2.49 each; easily making a profit of $0.70 per book sold. Tablet style book with a colorful plastic spiral binding. At least 36 pages in every Travel Tablet Coloring Book, hours of coloring fun with games, puzzles, mazes and connect the dots, word search and a heavy chip board backing. This is a perfect 'Travel Size' coloring book on a plane, train or in an automobile.